Hawick Linden's man of the match, Graham Colville (archive image). After being defeated on all five of their previous League visits to Bangholm, the Linden finally came away victorious. It wasn’t just any old win though, as this was the best performance by the Royal Blues this season against a more than useful Trinity Accies side. 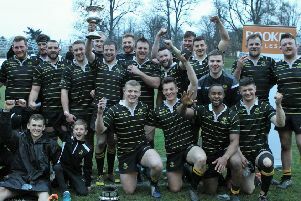 The final scoreline in this Tennent’s East Region League 2 meeting may look convincing but it doesn’t tell the full story of how it had to be earned by sheer hard work, from a Linden team which more than made up for its performance the previous week by showing just what it can do when the mindset is right. The Linden created some early danger from a Daniel Elliot kick ahead of a loose ball and then a charge down by Kris Rowley, but neither came to anything. Kieran Murphy missed a penalty chance on five minutes and then Graham Colville intercepted to break away but was brought back for an earlier infringement. It took until the 21st minute for the first score to arrive. Camped on the home line, a number of pick and goes by the Linden forwards eventually sucked in the defence before going wide to Murphy. The winger still had work to do but, with some help from his teammates, he was driven over the line. Trinity looked to strike back. First, they missed a penalty kick at goal and a further penalty was kicked to touch five metres out to give a great chance of a catch and drive try. The Royal Blues pack did a great job, though, to force back the maul and the threat was averted. The Linden forwards continued to carry ball relentlessly and, when penalties were awarded, two opportunities to kick for goal were successfully taken by Kris Rowley. The half-time whistle blew after his second kick and the Linden took a hard-earned 11-0 lead into the break. Two minutes into the second period, they missed another penalty kick to extend their lead but did score soon after. Some brilliant play by the forwards, showing control and patience through several phases, ended with Simon Spalding forcing his way over for the try and Rowley converting. Three minutes later, Accies hit back. Some lovely running by Rorie Watson saw the full-back bemuse the visitors as he weaved his way to the posts and skipper Neil Morrison converted. Murphy was then high-tackled as he headed for the corner. There was maybe a case for a penalty try, but it wasn’t forthcoming. The Linden opted to run the award but a dropped pass meant the opportunity was lost. The visiting bench was helping to make an impact as the Royal Blue forwards started to produce some wonderful offloading to get in behind the home tacklers. They should have added to their total on 62 minutes after James Rowley and Matthew Mallin were involved in the lead-up to creating a two-man overlap. But it wasn’t used and, when tackled short, what looked a certain score was missed. Fortunately, a try arrived score soon afterwards. James Rowley and Jordan White took ball on, Elliot made a half break and Graeme Anderson barged over, just managing to get the ball down. Kris Rowley converted. Trinity then broke up the touchline and passed inside but the ball was lost forward as it looked like they were about to touch down. From the scrum five, Colville picked and made big yardage to relieve the danger. On 73 minutes, some superb lead-up play found Colville out on the wing. The number eight ran up the sideline and stepped inside for his 13th try of the season, which secured the bonus point to a huge cheer from the sizeable Linden support. It was Colville who won the Linden man of the match award but, in reality, any number of those in Royal Blue could have done so. The effort from 1 to 15, plus the bench, was immense. Most impressive was the control shown in playing through several phases to wear down a team that belies its league position. Thus, in the second period, the offloading game came into play and started to create the space that was much harder to find earlier in the game. Hawick Linden: C. Glendinning, K. Murphy, D. Elliot, G. Anderson, R. Renwick, K. Rowley, E. Wood; S. Donnelly, P. Drysdale, S. Spalding, J. Wilson, J. Rowley, L. Sharkey, M. Mallin, G. Colville. Subs: J. White, S. Hair, E. Hair, L. Stormont, G. Cunningham, S. Walker, G. Scott.